This study examines variations in breast cancer screening among primary care clinicians by geographic location of clinical practice. A cross-sectional survey design was used to examine approaches to breast cancer screening among physicians, nurse practitioners, and physician assistants involved in primary care practice. A summary index of beliefs about breast cancer screening was created by summing the total number of responses in agreement with each of four survey items; values for this summary variable ranged between zero and four. Respondents were classified into urban, rural and suburban categories based upon practise location. Among the 428 respondents, agreement with "correct" responses ranged from 50% to 71% for the individual survey items; overall, half agreed with three or more of the four breast cancer screening items. While no significant differences were noted by practice location, variation in responses were evident. Reported use of written breast cancer guidelines was less in both suburban (OR = 0.51) and urban areas (OR = 0.56) when compared to clinicians in rural areas. Development of an evidence-based consensus statement regarding breast cancer screening would support a single set of unambiguous guidelines for implementation in all primary care settings, thus decreasing variations in how breast cancer screening is approached across varied clinical settings. Breast cancer is the most common cancer (excluding non-malignant skin melanomas) and the second leading cause of cancer deaths among women in the US . During the 1990s, the observed incidence of female breast cancers increased, and was accompanied by a significant decrease in breast cancer mortality . Both trends may be due, in part, to the increased utilization of mammography . From 1989 to 1997, the percentage of women aged = 40 years who reported "ever had a mammogram" increased from 63.9% to 84.8% [3, 4]. However, there was a substantial difference between those who were ever screened and the proportion of women screened in the previous 2 years (84.8% v. 71.3% ) . Relative to areas of higher population density, areas of lower population density have been noted to have increased breast cancer incidence  and breast cancer mortality . Rural women were also less likely than their urban counterparts to have received a mammogram . This difference was attributable to disparities in education level, household income, and health insurance coverage. Rural women were also less likely than urban women to have a recent mammogram or clinical breast exam (CBE) . Conversely, a recent qualitative study reported that rural women had higher rates of mammography and CBE than their urban and suburban counterparts . Providers of primary care services play a critical role in determining patient compliance with preventive services through direct recommendations to their patients [10–12]. Women who were "off schedule" for regular mammograms were significantly less likely to have a regular physician and to have received a physician recommendation for a mammogram than "on schedule" women . Another study of family physicians and general internists showed that 70% of women who received a provider referral completed a screening mammography within one year versus only 18% of self-referred women . Over 90% of rural women report that a doctor's recommendation to have breast cancer screening is "important" . In the American Cancer Society's second survey of physician attitudes and practices in early cancer detection, physicians reported that screening guidelines influenced their referrals for mammograms . It should be noted that multiple factors contribute to clinician compliance with guidelines including: provider-related, guideline-related, patient-related, and environment-related variables . Our study examined geographic location of practice to identify any variations in approaches to breast cancer screening among clinicians (physicians, nurse practitioners, and physician assistants) in primary care settings. Comprehensive surveys examining issue of cancer prevention and control were mailed to primary care physicians, nurse practitioners, and physician assistants (n = 1761) in an 8 county region of Western New York. Primary care physicians included family physicians, general practitioners, general internists, and obstetricians/gynaecologists. Mailing addresses were obtained from the provider directories of a major regional health maintenance organization (HMO), supplemented with mailing lists from the Nurse Practitioner Association of Western New York (NPWNY), and the Western New York Physician Assistants' Association (WNYPAA). Western New York ranks among the top communities in the US for Health Maintenance Organization (HMO) penetrance. For this reason, essentially all primary care providers are included in HMO practitioner mailing lists (96%-confirm this figure). An initial mailing to primary care physicians and non-physician providers (nurse practitioners and physician assistants) was performed in February 2001, followed by two additional mailings to non-respondents at 4-week intervals. The first follow up mailing was the same as the initial mailing and included an additional copy of the questionnaire. The third mailing was a postcard reminding clinicians to return their surveys. The survey consisted of 22 items eliciting information on clinician knowledge, attitudes, and behaviours concerning the delivery of general preventive and cancer screening services, as well as personal and professional demographic information. The survey was pre-tested for content validity using a convenience sample of health care clinicians. 1. At what age should an average-risk woman initiate screening for breast cancer using clinical breast examination? [accepted answer: 20 years] . 2. At what age should an average-risk woman get a baseline mammogram? [accepted answer: 35 years]. No current guidelines address this item, although it was a prior recommendation of ACS, it is not addressed in their current guidelines. 3. At what age should an average-risk woman begin having mammograms every 1–2 years? [accepted answer: 40 years] [15, 17–19]. 4. At what age should an average-risk woman begin yearly mammograms? [accepted answer: 50 years] [15, 17, 18]. Since no single organization has issued breast cancer screening guidelines, which address all of the four screening items, we relied upon guidelines issued by several different organizations. For example, the American Academy of Family Physicians [18, 20] and the 2nd United States Preventive Services Task Force (USPSTF) advise mammography every 1–2 years for women aged 50–69 years . (Since completion of data collection for this project, the 3rd USPSTF released an updated statement advising mammography, with or without clinical breast examination, every 1–2 years for women aged 40 years and older ). A summary index of beliefs about breast cancer screening was created by summing the total number of responses in agreement with these items; values for this summary variable ranged between zero and four. It is important to emphasize that the focus is not on "correct" versus "incorrect" responses, but rather the variations among respondents. For example, if a large proportion of respondents indicate the same response to an item(s) this would indicate limited variation. Demographic information collected on respondents included clinician age, gender, race/ethnicity, professional groups, board certification, specialty, practice structure, work schedule, involvement with supervision of trainees, and the zip code location of their clinical practice. Using 2000 United States (US) Census figures and geographic land area (in square miles), the population density of each zip code area in Western New York was determined (population/square mile). Calculated population densities were matched with the clinical practice site zip codes provided by survey respondents. Practice site zip codes were then divided into urban, rural, and suburban categories. The analysis is based on the location of each medical practice and not on the residence of the clinician or patients. All zip codes identified within the major cities of WNY, Buffalo or Niagara Falls were categorized as "urban." Each of these urban areas had population densities exceeding 1000 persons/square mile (persons/mile2). Communities surrounding Buffalo and Niagara Falls were identified as "suburban" if they were contiguous to these major cities and had population densities between 500–1000 persons/mile2. Although five zip code areas in Erie and Niagara Counties had population densities exceeding 1000 persons/mile2 (Hamburg [1050.4/mile2], East Amherst [1068.5/mile2], North Tonawanda [1222.5/mile2], Tonawanda [3027.8/mile2], and Depew [3269.1/mile2]), they were classified as suburban areas for this study. These areas are distinctly separate from the urban centers, moreover these communities have higher socio-economic status and are not burdened with the problems often associated with urban areas. Based on these changes, 17 clinicians were reclassified (4%,17/428). The remaining zip code areas were categorized as "rural" if their population density was less than 500 persons/mile2. The majority of these communities are considered rural areas of Western New York (WNY) by local opinion. However, communities with total populations of 2500 persons or more were classified as "suburban" consistent with US Census criteria. This re-classification impacted Fredonia (total population 10706), Olean (20976), Batavia (22924), Clarence (8391), Lockport (48859), Jamestown (49478), and Lewiston (12104); ## of clinician were reclassified. Overall, this process resulted in 59% of respondents classified as urban, 18% as suburban and 23% as rural. Chi-square statistics were used to compare demographic and professional characteristics of respondents between the geographic categories. Chi-square analysis was also utilized to assess associations between responses to breast cancer screening items with independent variables such as specialty group and demographic characteristics (age category, gender, etc.). Nonparametric tests were used to evaluate differences in age and the reported number of hours of continuing medical education credits (CME) as these variables were not normally distributed. Odds ratios (with 95% confidence intervals) were used to compare summary scores for breast cancer screening and utilization of breast cancer screening guidelines among respondents within geographic categories. In addition, we used a multivariate logistic regression model to test whether geographic category represented an independent predictor of the summary score for breast cancer screening and use of written screening guidelines. Results are presented as adjusted odds ratios and 95% confidence intervals. SPSS 10.1 software (SPSS, Inc. Chicago, Ill.) was used for the analyses. 4. Persons who did not report a practice site zip code (n= 5). Thus, analyses were based upon responses from 428 practitioners: 179 physicians, 185 nurse practitioners, and 64 physician assistants. The majority of respondents reported practicing in urban areas (59%), with a relatively equal distribution of respondents practicing in rural and suburban areas (23% and 18% respectively). As summarized in Table 1, the suburban and urban respondents were more likely to be female. Respondents did not differ by age or race. Rural respondents were more likely to be physicians (54%), whereas a large proportion of both suburban and urban respondents were either NPs or PAs. Also, more rural practitioners were board-certified (78%) compared to suburban and urban practitioners (59% and 60% respectively). Urban practitioners were more likely to report being involved in the supervision of trainees (69%). Among physician respondents, family physicians or general practitioners were more likely to be located in rural areas (76%). chi square = 3.0, df 4, N.S. chi square = 2.67, df 4, N.S. chi square = 1.03, df 2, N.S. chi square = 5.54, df2, N.S. Figure 1 summarizes responses to each of the individual breast cancer screening questions. 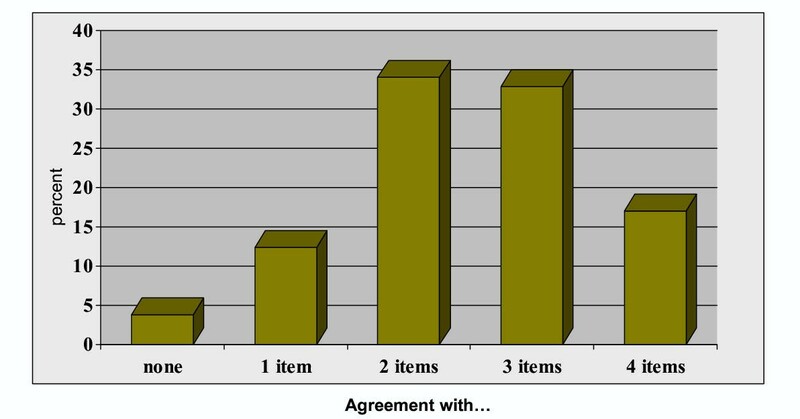 Agreement with "correct" responses ranged from 50% to 71% for the individual items. Overall, 50% agreed with 3 or more of the four breast cancer screening items. Figure 2 presents the distribution of scores for the summary index. While no significant differences were noted by practise location, variation is evident illustrating heterogeneity in responses. As illustrated in Figure 3, the distribution of summary index scores differed by clinical group (p = 0.049). 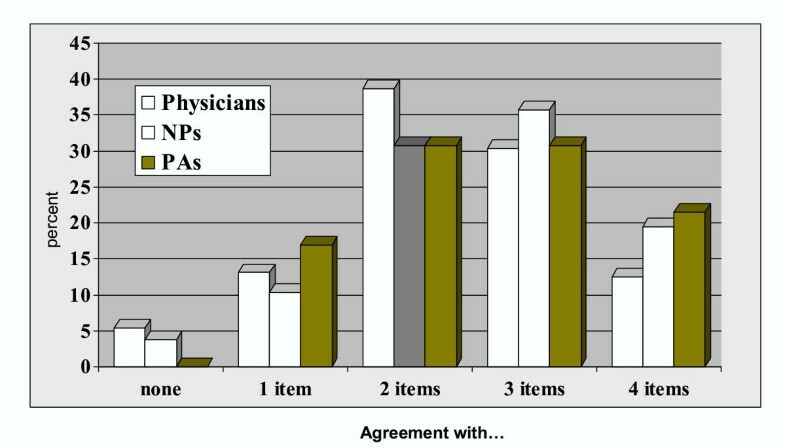 When groups of clinician were compared separately, the distribution of scores differed only for physicians compared to nurse practitioners (p = 0.017). 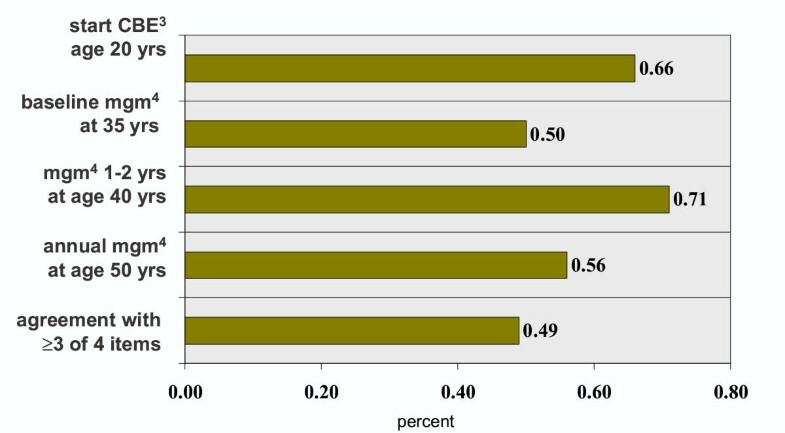 Distribution of responses to four items on breast cancer screening (percent agreement with "correct" response to each statement) by primary care clinicians, Western New York 1. 12001 Survey of primary care clinicians (MDs, NPs, PAs) in WNY. No significant differences by geographic region. Distribution of responses to four items on breast cancer screening (percent agreement with "correct" response to each statement), by clinician group, Western New York1 . 12001 survey of primary care clinicians in WNY. Overall chi-square = 6.05, p= 0.049. For physicians compared to NPs, p = 0.017; no other comparisons among clinician groups were statistically significant. Overall, about one-half of respondents agreed with three or more of the four breast cancer screening items (Table 2). There were significant differences between age tertiles with the <40 year old group (61%) being more likely than the >50 year old group (34%) to correctly answer 3 or more of these items. Females (56%) were more likely than males (39%) to correctly answer three or more items (p < 0.001). Differences were also observed when the summary index was analysed by practice structure, with only 30.4% of solo practitioners agreeing with three or more of the four breast screening questions. There were no significant differences by geographic categories in the summary measure or when individual questions on breast cancer screening recommendations were compared. Summary measure of approaches to breast cancer screening among primary care health professionals (% of respondents agreeing with 3 or more of 4 survey items), by geographic category. *Adjusted for age and practise structure. When the suburban group was compared to urban group using the suburban group as the referent, the crude OR = 0.92 (95% CI 0.55–1.54); adjusted* OR = 0.94 (95% CI 0.55–1.64); n = 408. As shown in Table 3, approximately 65% of all respondents reported use of some written breast cancer screening guideline. Analysis of geographic variations in the reported use of written breast cancer guidelines, after adjusting for age and professional designation (physician, nurse practitioner, physician assistant) revealed less use of guidelines in both suburban (adjusted OR = 0.51, 95% CI 0.26–0.98) and urban areas (adjusted OR = 0.56, 95% CI 0.33–0.97) when compared to rural areas. Reported utilization of written breast cancer screening guidelines among primary care health professionals, by practice location. *Adjusted for age and clinical groups (MD, NP, PA). When the suburban group was compared to urban group using the suburban group as the referent the crude OR = 1.04 (95% CI 0.61–1.75); adjusted* OR = 1.14 (95% CI 0.66–1.95); n = 325. While there were significant sociodemographic and practice-related differences by geographic regions, no significant variations were observed in the summary breast cancer screening index among urban, suburban and rural areas. These results are important in highlighting differences in how breast cancer screening is approached, with agreement ranging from 50% to 71% for the individual breast screening items. Moreover, this group of primary care health professionals demonstrates marked variation in approaches to breast cancer screening since agreement with three or more of the four breast cancer screening statement was just 50%. While this variation could be due to a variety of factors, it is more likely that these differences reflect clinicians' attempts to reconcile conflicting recommendations issued by various organizations. We defined one "accepted" response to each item to serve as a basis from which to examine both dichotomous and polychotomous responses. While others might debate which response category is "acceptable", the fact that responses are distributed across several categories is more noteworthy. That is, regardless of the category selected, variation in responses is apparent. It is worth mentioning that the response option which we designated as the "accepted" answer was generally observed to represent the modal response. While a potential limitation of this study is the low response rate (30%), it is comparable to the lower range of response rates of health care providers reported in a review article of this topic . Our study relied upon a passive response system without any financial inducements for completing a multi-page mailed survey. The response rates among the geographic regions surveyed were similar. It is possible that clinicians working in non-primary care settings, and specialities with dual designations as "primary care providers" may have been less likely to complete the survey because it may have been perceived as outside their usual scope of practice. Also, the length of the survey may have contributed to a reduced number of responses. We were not able to more fully explore sociodemographic and professional variations between respondents and non-respondents due to limited baseline information beyond mailing addresses and practice location. While these limitations may impact the generalizability of our study, the comprehensive approach of including physicians, PA, and NPs in combination with the large number of respondents represent unique strengths. The predominance of women among urban and suburban respondents may be due to the overrepresentation of nurse practitioners in these groups. Urban providers were more likely to be involved in the supervision of trainees which is reflective of the locations of clinical training centers in urban centers of Western New York. On the other hand, rural providers were more likely to report their specialty as family or general practice. This is consistent with a national trend of an increasing physician supply of family physicians/general practitioners in rural communities . Interestingly, rural providers were also more likely to be board-certified than their urban and suburban peers. The overrepresentation of both family physicians and nurse practitioners may account for this variation. Another issue which is not addressed by these data is what clinicians think about the guidelines. In other words, it is not clear if the clinicians do not follow the guidelines because they are not familiar with them, if they have reviewed the guidelines and don't agree with them, or if they simply find conflicting guidelines to be confusing. Guidelines for breast cancer screening are not uniform across organizations. Despite the recent recommendation from the 3rd USPSTF advising mammography, with or without clinical breast examination, every 1–2 years for women ages 40 years and older , the issue of mammography among women age 40–49 remains under debate. The practice of obtaining a baseline mammogram, adopted by many primary care physicians in clinical practice, does not appear in the guidelines of any major organization. The source of these guidelines consulted for this paper and included the American Cancer Society, the National Cancer Institute, specialty societies and health insurance companies. This study suggests that primary care clinicians, including physicians, nurse practitioners, and physician's assistants, lack a consistent approach to breast cancer screening. This lack of agreement does not appear to be impacted by geographic practice location but rather is likely a more global clinical issue. The implications of this lack of consistency for individual patients or groups of patients are uncertain, since it is unclear how differences in approaches to breast cancer screening translate into differences in clinical practice. Application of an industrial perspective to reduce variation would suggest opportunities to develop a more consistent approach to how breast cancer screening is addressed in the primary care setting. Development of an evidence-based, consensus statement regarding breast cancer screening, with broad endorsement, would support a single set of unambiguous guidelines for implementation across primary care settings. We gratefully acknowledge the support of the Oishei Foundation of Buffalo, which provided the funding for this project. LS and MM were responsible for the study concept and design. MM, JE, AM were responsible for the design and coordination of the acquisition of data. MM, SL, LS, AS, AM participated in the analyses and interpretation of data. SL, MM, and LS drafted the paper while MM, SL, LS, AS, AM, JE were all involved in the critical revisions.